The hill of women. 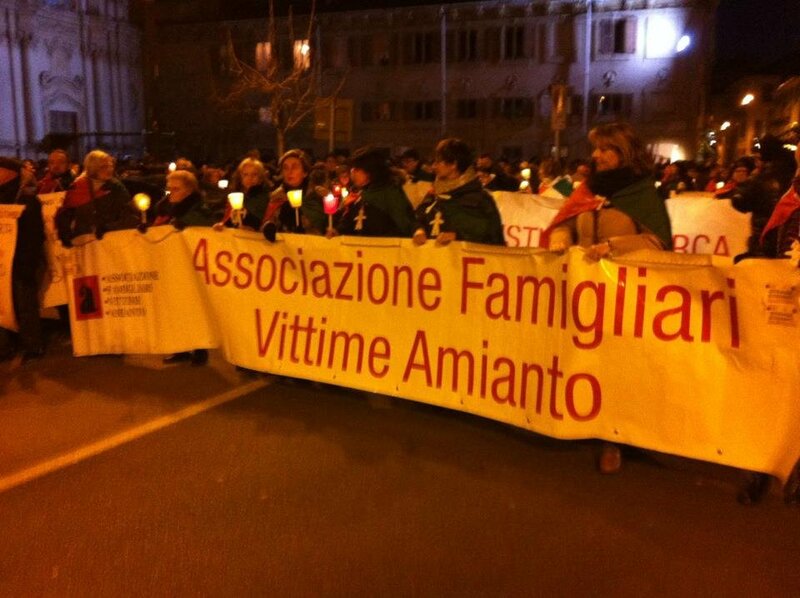 Photo reportage about the widows of Casale Monferrato. Asbestos is a set of minerals from the group of inosilicates. The exceptional heat resistance of the fiber has favored a massive spread, was mainly used to coat or replace flammable materials. In 1902 the merchant Alois Steinmannha purchased the license for the production of the mineral and opened in 1903, in Niederurnen, the "SchweizerischeEternitwerke AG". In 1907 was created the Eternit plant of Casale Monferrato: 94000 square meters of extension, including 50,000 covered. The factory was founded by the Italian engineer Adolfo Mazza (among other things he was the Italian engineer who in 1912 build the first machine for the production of pressure pipes in asbestos cement). The Eternit plant of Casale Monferrato represented the largest settlement of cement-asbestos in Europe. From 1907 to 1986, the people who worked in the factory have been about 5000, in the 50 employed about 1,000 people, rose to about 2,000 in '65 and stabilized around 1000 until the 80s. In subsequent years, the number of employees decreased progressively until the closure of the plant in June 1986 for bankruptcy. Asbestos was used in thousands of products, it is estimated that in Italy there are 23 million tons of materials consisting of asbestos cement disseminated throughout the territory. The diseases caused by the inhalation of asbestos dusts may be benign or malignant, between benign ones include: pleural effusion, pleural plaques, diffuse pleural thickening. The malignancies are characterized by long latency periods (15, 20, 30), among them are: asbestosis, also called interstitial pulmonary fibrosis, lung cancer, pleural mesothelioma. In Casale Monferrato there were 3000 cases of occurrence of asbestosis and pleural mesothelioma among former workers at the Eternit plant and ordinary citizens and the confirmed victims are 2200. Because of the serious pathogenic effects and persistence of asbestos exposure in the general environment and work places, the state launched the Italian Law 257 of 27 March 1992 with the purpose of prohibiting the extraction, importation, processing, use, marketing, treatment and disposal, as well as the export of asbestos and products containing it in the national territory, by regulating the treatment and disposal. With the law 426/1998 the site of Casale Monferrato appears to be one of the first intervention of national remediation in a contaminated area very extensive and requires remediation of soil, subsoil and / or surface water and groundwater to avoid environmental damage and health, therefore classified as a Site of National Interest, SIN. The decree of the Ministry of the Environment "20/01/2000 established the territorial delimitation which proceed to remediation. The project includes among others the reclamation of the so-called "polverino", removing covers of cement and asbestos. Il SIN in Casale Monferrato consists of 48 municipalities with a total population of 85 824 inhabitants as per 2001 Census. The production of the company Eternit begins in March 19, 1907 and ceased completely in June 6, 1986. The Schmidheiny family, until the 80s, owned Eternit factories in 16 countries with 23 000 employees, with an annual turnover of about 2 billion Swiss francs. The working conditions inside the plant have always been bad. For decades, convoys full of bags of asbestos bulk arrived at the station house, only to be downloaded manually, and placed on carts for individual processing departments. The raw asbestos was accumulated in very high silos, then there were the pickers to make it soft and amalgamable. Everything was always done by hand in a highly dusty environment. The struggle of the workers and citizens can be summed up in three phases. The first phase goes back to the 60s, when, facing extremely heavy working conditions, low wages and very little trade union rights, workers have reported problems related to the work environment to claim and obtain a higher salary. One of the most significant dates back to 1961 when trade union agitation, based precisely on the issue of the work environment, results in complete closure of the bridge over the Po with clashes with security forces and arrests. Despite all the company has continued for a long time to minimize health risks and to deny the presence of dust in the wards. The second phase of the struggle takes place between the end of the 60s and the 1977. The engagement of auditors (especially the CGIL) about the Eternit cases, from the so called “hot autumn” and then in the seventies, assumes a degree of superior incisiveness. The struggles were oriented on health protection in the face of undeniable finding of lung diseases that workers contracted, generically called asbestosis or silicosis or even more modestly "dusts in lungs". In 1977 were obtained the first scientific surveys (work done by University of Pavia), the first data of environmental impact, the installation of the first vacuum systems with filters to contain the dust in the factory and its spread throughout the territory. Dates back to 1981 one of the most emblematic civil cases against Eternit and Inail filed by 80 workers. In the three sets of proceedings, the cases ascertained the existence of hazardous conditions inside the plant. In 1986 failed all establishments of Eternit on the Italian territory, and about 350 workers lost their jobs. In 1987, the French Eternit proposes to reopen the factory in Italy to deal with the problem of unemployment of former workers, but the Chamber of Labour (supported by a large group of medical and environmental groups) strongly opposes the reopening, proposing, as alternative, the imminent start of the reclamation. The third phase starring the birth of AFeVA (Association of relatives and victims of asbestos) in 1988. These were years of struggle for asbestos ban, large demonstrations, sit in against the institutions. Numerous complaints have been made to the Magistrature of Casale in the late 80s and in the 90s. But no one had initiated investigations or inquiries. Epidemiological investigations were kept in storage for a few years. In 1995 the Municipality of Casale Monferrato decide to buy the former production site, now abandoned, to initiate the necessary remediation measures for the recovery of the area. It is made up of a Commission study to support the design of the intervention composed of technical experts of the Municipality, Health Authority (ASL and ARPA), the Province and the Region. These works, which began in 2000, were completed only in 2006. In 2009, following the investigations carried out by Raffaele Guariniello at the Court of Turin, began the trial of Stephan Schmidheiny, former chairman of the board, and against Louis de Cartier de Marchienne, director of the company in the sixties (De Cartier died in 2013 at 92 years). 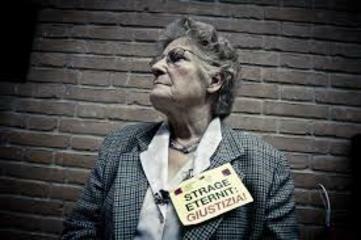 They are held responsible for mesothelioma deaths occurred among employees of Eternit factories and citizens of Casale remained for years in direct contact with asbestos. On 13 February 2012, at first instance the Court of Turin sentences De Cartier and Schmidheiny to 16 years of jail for "intentional permanent environmental disaster" and "voluntary omission of accident prevention regulations", forcing them to compensate about 3,000 plaintiffs. On 3 June 2013, the punishment is "partially reformed" and increased to 18 years. In the process of November 2014 Stephan Schmidheiny was acquitted. Project Details In 1907 was created the Eternit plant of Casale Monferrato: 94000 square meters of extension, including 50,000 covered. From 1907 to 1986, the people who worked in the factory have been about 5000, in the 50 employed about 1,000 people, rose to about 2,000 in '65 and stabilized around 1000 until the 80s. Asbestos was used in thousands of products, it is estimated that in Italy there are 23 million tons of materials consisting of asbestos cement disseminated throughout the territory. The diseases caused by the inhalation of asbestos dusts may be benign or malignant, between benign ones include: pleural effusion, pleural plaques, diffuse pleural thickening. 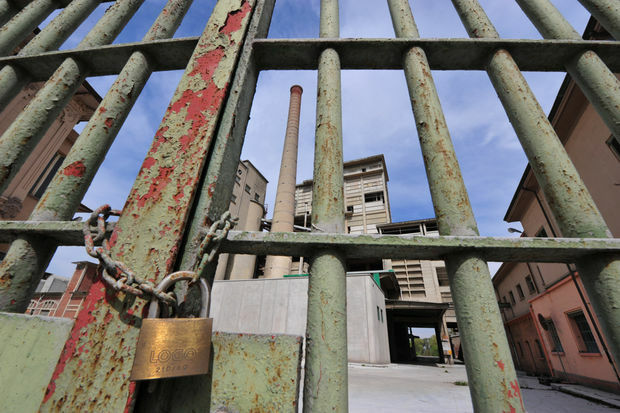 In Casale Monferrato there were 3000 cases of occurrence of asbestosis and pleural mesothelioma among former workers at the Eternit plant and ordinary citizens and the confirmed victims are 2200. The Report SENTIERI 2011 of the National Institute of Health dedicates a chapter to Casale Monferrato and indicates that the presence of asbestos was the sole motivation for the recognition of Casale Monferrato as a Site of National Interest, SIN. In the territory were observed increases in mortality for various types of cancers, including malignant tumor of the pleura, due to exposure to asbestos. 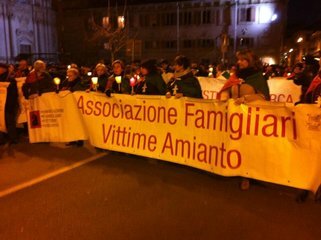 Development of Alternatives The Syndicate and the Afeva - Association of relatives and victims of asbestos in Casale Monferrato - have always pursued with determination and without compromise three main aims: justice, rehabilitation, care and health research. To prevent the disaster of asbestos, it is necessary to banish it all over the world and implement, in each country, a national policy and territorial census to spread the risk, creating a network of disposal centers with public services for the collection of asbestos waste and financial incentives / tax. It should strengthen and coordinate scientific research and monitoring of various experiences and research methods to ensure to all patients care pathways and protocols more efficient and accessible. Finally AfeVA and other environmental groups, calling for a more active role of the European Union in the international fight against asbestos (still in use in three-quarters of the planet) and for environmental rehabilitation in the continent. A required for new directives also to stimulate identification of responsibilities and compensation for damages. Why? Explain briefly. The history of Casale Monferrato is not one of the many, but the symbol of a community marked and destroyed by the cynicism of those who, to accumulate profits, did not hesitate to put at risk the health of employees, their relatives and of those who, however, breathed "the dust of death." The sentence of acquittal of Stephan Schmidheiny of 2014 is an insult to the memory of those who are no more, and the dignity of family members who have never stopped asking for truth and justice. The population Casalese continues his fight for more than 30 years, and despite not having achieved all the desired objectives, the strength and tenacity are taken as an example by those who, in the world, is pursuing the same battles. LAW March 27, 1992, n. 257: Rules relating to the cessation of asbestos. Amianto:responsabilità civile e penale e risarcimento danni, Maggioli Editori, 2012. M. Corlianò, Culture nella polvere. Biopolitica dell'amianto, informazione e potere nella società della conoscenza, FrancoAngeli, 2012. G.Nebbia, Le dinamiche dello sviluppo industriale in Italia, in Lo straniero n° 170/171,contrasto,2014. Report Sentieri 2011 Studio epidemiologico nazionale dei territori e degli insediamentiesposti a rischio da inquinamento:RISULTATI.